Its been quite sometime since I've updated bloggie here. Who knows holidays could be this busy, tiring and yea I can tell you guys that I haven't been getting enough sleep. I mean that lazy arse, holiday mood sleep. Thank God for some dinner for two and movie night with yours truly. It takes that whole day tiredness away. I'm only actively updating instagram these days. Its quite a helpful thing to remind me of the stuffs I did and done. I don't want to re-post photos I've taken on instag. I'd do that sometimes but today I'll post something else. Its my breakfast the other day before I head off to Shangri-La's Rasa Ria Resort to fetch #panda. 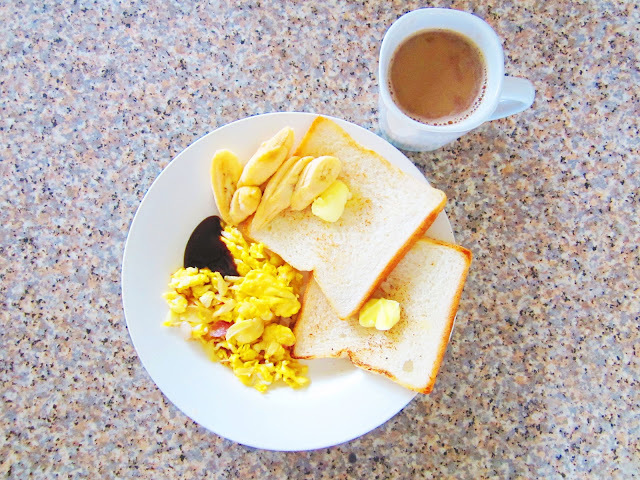 Coffee (a must), two toasted bread with a little bit of those low fat butter, scrambled eggs with lots of shallots (because I love them), one whole banana and oyster sauce with a pinch of salt to taste. Ahh, heaven. Been taking healthier foods since being here. Its nice that he also have the same thought of not having carbonated drinks, less fatty foods and maintaining our weight. I'm happy with the changes that are taking place now. Maybe its because I'm getting older and the only thing I can think of as the time pass is maintaining healthy lifestyle. yummy tho. perfect one to start your day. Yes, lasted me 'til tea time.skipped lunch.